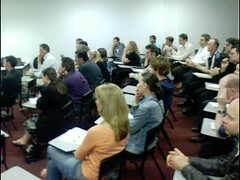 Brisbane held a great WSG meeting last night with 49 peole attending. Lyn Eagers – manager of VisETrain talked about blind users perspective of the web, as well as demonstrating JAWS in action. Dr. Michael Rees describe the growing maturity of the Ajax technologies used to develop highly-interactive web sites that come into the Web 2.0 category.